Campus ranks seventh in nation for computer science Ph.D. and M.S., DANM M.F.A. Michael Mateas (center), associate professor of computer science, with graduate students studying computer game design in the Expressive Intelligence Studio. Photo by Robinson Kuntz/Santa Cruz Sentinel. UC Santa Cruz's graduate programs in game design were named among the top 10 in the nation by the Princeton Review and GamePro Media. The campus's computer science Ph.D. and M.S., along with its M.F.A. in Digital Arts and New Media (DANM), earned the school a seventh place ranking on the survey. This is the first year the Princeton Review, an education services company, has surveyed graduate programs in game design. "It's wonderful to see our programs get this acknowledgment from the Princeton Review and GamePro," said Art Ramirez, dean of the Baskin School of Engineering. "We pride ourselves on being leaders in game research. This just confirms what our students already know, that they are getting one of the best educations possible in the field of game design." UC Santa Cruz is one of only two schools on the West coast, and the only one in Northern California, to make the Princeton Review/GamePro top 10. Schools were chosen based on a survey conducted in the 2010-2011 academic year of 150 institutions offering computer game design coursework or degrees in the United States and Canada. There are currently 22 Ph.D students, three M.S. students, and seven M.F.A. students studying games at UC Santa Cruz. Students doing the games-focused Ph.D. or M.S. in computer science augment their basic computer science knowledge with classes in topics such as artificial intelligence in games, computer animation, playable media, and interactive narrative. Graduate-level game courses at UC Santa Cruz are taught largely by tenure-track faculty whose primary research area is games. The Ph.D. program takes about five years. 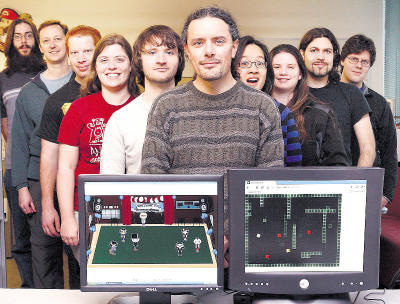 "It makes me very proud to see the quality of our game design program recognized," said Jim Whitehead, professor and chair of computer science, who helped create the game design program. "It is a testament to the strength and excellence of our games faculty and our students." The 2-year Digital Arts and New Media M.F.A. program focuses on the development and study of digital media and the cultures that they have helped create. Faculty and students come from a variety of backgrounds--the arts, computer engineering, humanities, the sciences, and social sciences--to pursue interdisciplinary artistic and scholarly research and production while broadly examining digital arts and cultures. Students interested in games generally join the Playable Media research group. "The Playable Media research group forms a bridge, on campus, between the arts and engineering; and it connects, in the larger world, industry, academia, and the art world," said Warren Sack, professor and program chair of DANM. "Games are moving to the center of both high and popular culture and taking an increasingly important role in the definition of the economy. The research and productions of the Playable Media group have become vital to expanding our understanding and imagination about the possibilities of this new medium." UC Santa Cruz also offers an undergraduate degree in computer game design. For more information on the game design programs at UC Santa Cruz, visit games.soe.ucsc.edu.